Well: that’s all I needed to know. Oddly, I’d seen the show’s press release and checked the listing on the Neue Gallery site and neither of them mentioned the scents and sounds. Even most of the reviews neglected to mention this very innovative mixed media approach to presentation. 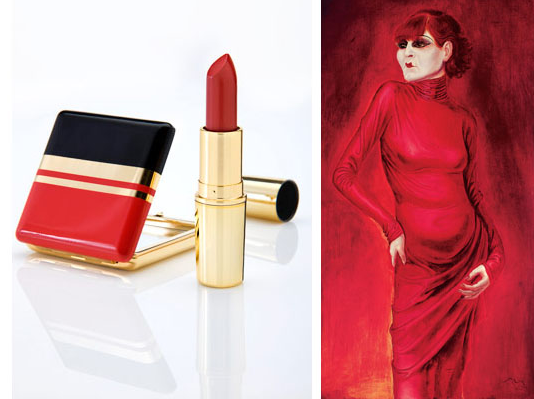 What was, mentioned, all over the internet and not just on the art sites, was the fact that Estée Lauder had created it’s blazing Berlin Red and Bauhaus style compact to launch in time for the Otto Dix show. The cosmetics will be sold exclusively by the Neue gift shop throughout the show’s duration. Co-founded by Ronald S. Lauder, the Neue Gallery appears to be boldly leveraging more synergies than the old fashioned art world has been comfortable with. Let’s see where this goes. More to come: I plan to meet this week with Ms. Ammon to discuss the Neue Gallery’s recent experiments in sensual surround presentation and it’s big step into cross-marketing.